Lorraine Damich, director of MVH's Orthopedic Institute, chats with Darla Kearns, who had knee replacement surgery at MVH. People walked in without walkers, canes or pain. One woman even showed off her dancing skills. 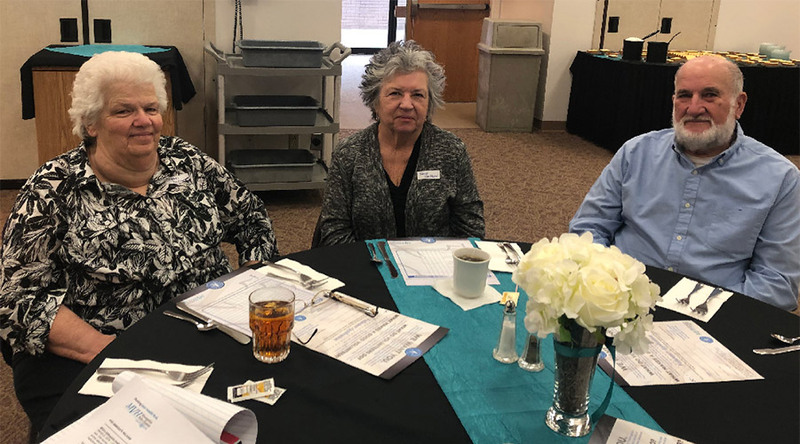 On March 21, more than 25 men and women attended the 25th Quarterly Reunion Luncheon for people who had total hip and knee replacement surgery at Monongahela Valley Hospital's (MVH) Orthopedic Institute. 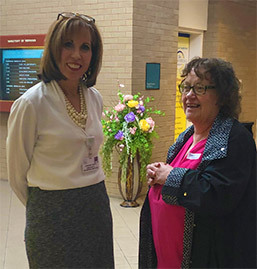 "Since our patients move freely without pain, it's always difficult to differentiate our actual patients from their coaches at these luncheons," remarked Lorraine Damich, MSN, RN, CPAN, ONC, director of MVH's Orthopedic Institute. Monongahela resident Nancy Staffen attended the luncheon with her husband/coach, Larry Staffen. She had total hip replacement surgery two years ago and returned to the Orthopedic Institute in 2018 to have knee replacement surgery. "The pre-testing process and class prior to surgery were particularly helpful," she said. Established in 2013, the Orthopedic Institute at Monongahela Valley Hospital changed the way people experience joint replacement surgery. The program includes a dedicated hospital unit exclusively for joint replacement patients; prehab, that includes pre-operative classes and testing; coaches who are active participants in the patients' care providing encouragement and support; aggressive daily schedules that include multiple group therapy sessions; competition in distance walked among patients; and after-care support. The Institute is the only local joint replacement program that evaluates each patient on multiple patient satisfaction criteria. Patients are surveyed on pain and functionality of sitting, standing, walking, using steps and more prior to surgery and then again at various increments from six week to two years following their surgery. These outcomes are then analyzed during monthly performance improvement team meetings to ensure continuous improvement which ultimately leads to patient satisfaction. Based on feedback from patients who had hip or knee replacement surgery following the Orthopedic Institute's program, it's a positive experience - and the Hospital has the data to prove it. Of the patients who had total joint replacement surgery at the Orthopedic Institute, 98 percent would recommend the Institute to others who need total joint replacement surgery. The program also boasts a 99 percent patient satisfaction rate. "I recommend this program to everyone I meet who has hip or knee pain," said Darla Kearns of Monongahela, who had both knees replaced at the Orthopedic Institute. The Orthopedic Institute positions Monongahela Valley Hospital as a Center for Excellence in joint replacement surgery and as a destination for high-quality care. Monongahela Valley Hospital was the first and is the only acute-care hospital in Western PA to earn The Joint Commission Gold Seal of Approval® for Advanced Certification for Total Hip and Total Knee Replacement. MVH also was named a 5-Star Recipient for Orthopedics by Healthgrades®. In addition, MVH received the Women's Choice AwardTM as one of America's Best Hospitals for Orthopedics for four consecutive years. Mable Huffman, and Nancy Staffen (l. to r.), who had total joint replacement surgery at MVH's Orthopedic Institute, returned for the Orthopedic Institute's 25th Quarterly Reunion along with Nancy's husband/coach Larry Staffen.